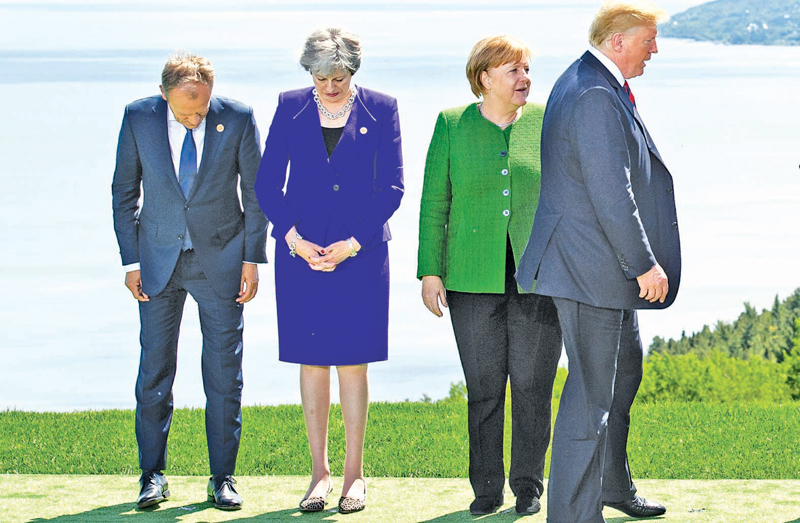 European Council President Donald Tusk (from Left), British Prime Minister Theresa May, German Chancellor Angela Merkel, and U.S. President Donald Trump prepare for a photo at the G-7 summit in La Malbaie, Canada, on June 7. Angela Merkel couldn’t have remained Germany’s chancellor forever. Even Helmut Kohl, who was chairman of the Christian Democratic Union and Germany’s longest-serving postwar chancellor, had to step down after 16 years. Kohl’s tenure ended in the usual way: In 1998, with unemployment and economic dissatisfaction rising, voters chose the left-of-center Gerhard Schroder over the right-of-center Kohl. But today, unemployment is at an almost historic low of 3.4 percent. Both youth unemployment and long-term unemployment, typical drivers of the anti-incumbent spirit, are low (though so is annual growth, at 2 percent). It is, of course, no coincidence that the wave of populist nationalism now breaking over the West began in the aftermath of the 2008 economic crisis, when millions of working- and middle-class voters lost savings, jobs, and future prospects. But the wave engulfed liberal politics even where economic pillars remained intact. Poland was Eastern Europe’s economic engine—its Germany—when the right-wing Law and Justice (PiS) party defeated the classically liberal Civic Platform in 2015. Civic Platform Prime Minister Donald Tusk had described his platform as the maintenance of “warm water in the tap.” When I was in Warsaw the following year, Konstanty Gebert, a columnist and former Solidarity leader, said to me, “He thought that was enough, but he was wrong. It is also no coincidence that hostility to immigrants and refugees runs much hotter in eastern Germany than in the wealthier and more open west. Yet during several visits to Dresden, near the country’s eastern border, I found that economics was not uppermost in the minds of either the officials of the right-wing Alternative for Germany (AfD) party whom I met nor even among the marchers in the weekly rally of the anti-immigrant group Pegida. The demonstrators were not lumpen; most were small-town folk who had seen a few Muslim refugees—often very few—and concluded that their world was under siege. The nationalist spirit has begun spreading westward: In elections this month in wealthy and worldly Bavaria, the AfD won more than 10 percent of the vote and entered parliament there for the first time. The right of center fell, the left of center collapsed, and both extremes profited.